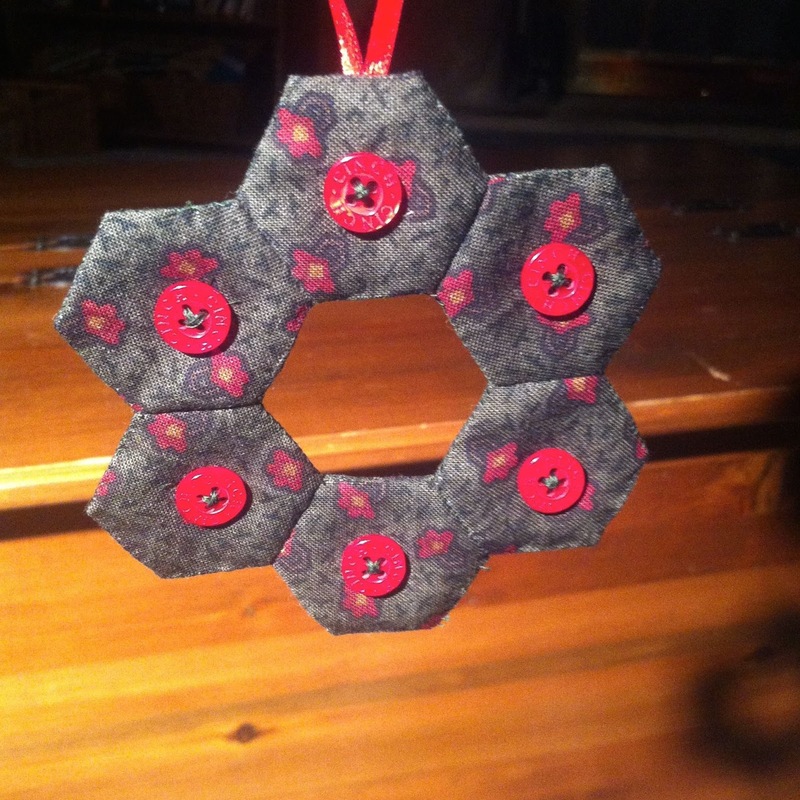 Many of the ornaments on my tree have been handmade by me over the years. In 2015, I added two more to my collection. The first is made from layered strips with a piece of cardstock sandwiched between two contrasting pieces of fabrics. I chose a red print for the one side and a gold print for the other. I may make these again, but maybe with some of the great decorative paper available on either side rather than the fabric. 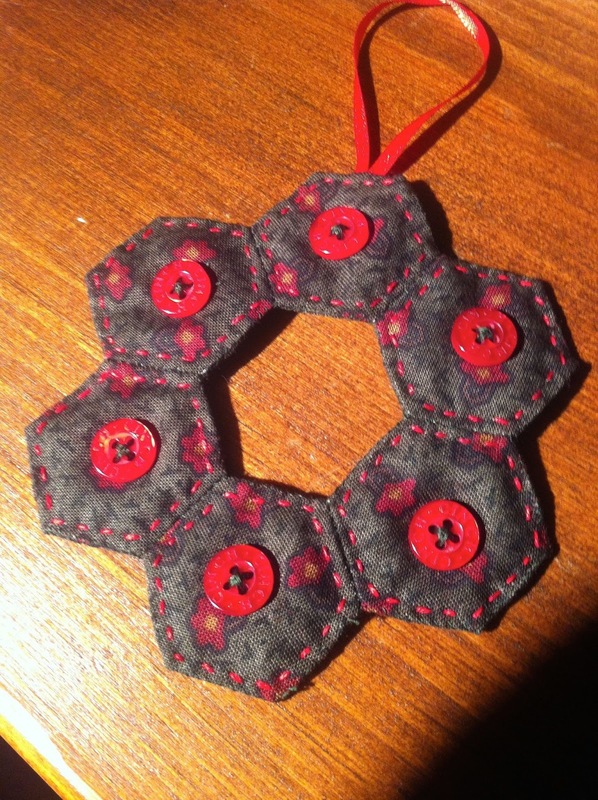 The second handmade ornament was this wreath from tiny (3/4") hexagons. I had originally thought to leave it just plain, but I just needed to add some embellishment. So I looked through my button box and found some little red buttons. It looked better, but was still missing something! And I dug into my embroidery floss bin for some red floss and outlined each hexagon with a running stitch. I love the way it turned out & it looked great on our tree! What about you? 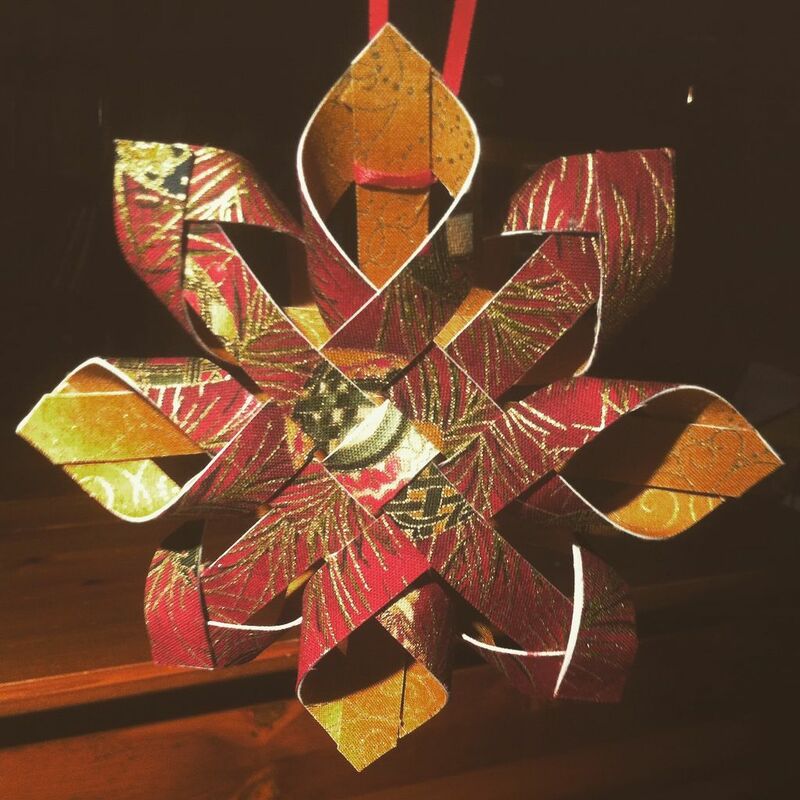 Do you make your own Christmas decorations? 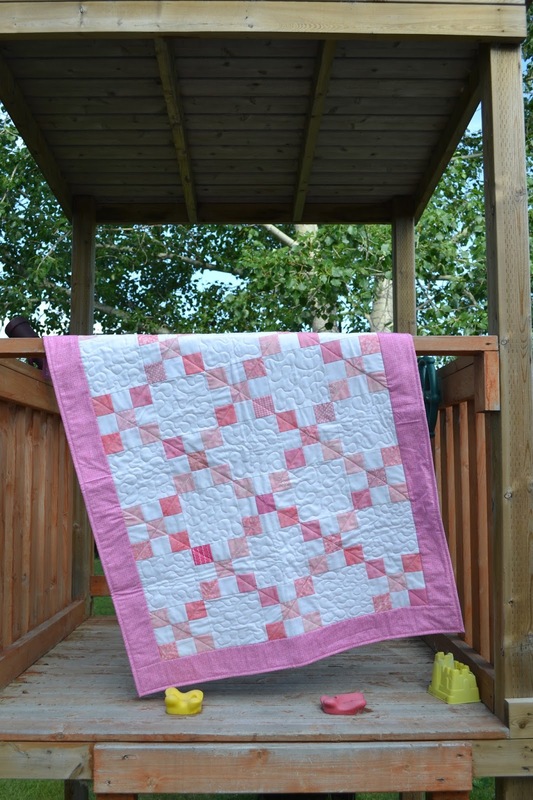 Craft sales are not my most favourite thing about my quilt business. I'm an introvert at heart and the full day of meeting and interacting with people wears me out! 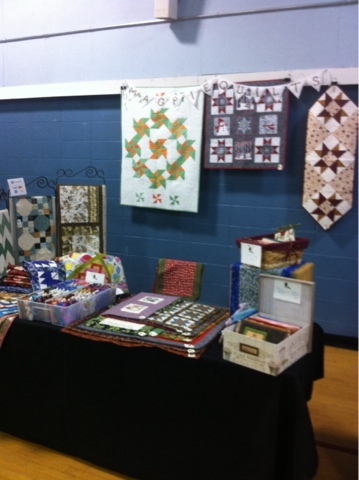 And at most craft sales vendors are limited in the amount of space they are allowed. That makes it hard to display larger quilts, so I tend to make up smaller items that are easier to display. 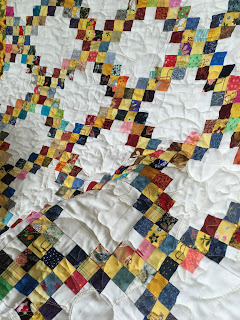 I find that buying a bed size quilt is a large purchase & most people are not willing to purchase a large quilt unless they've thought about it for a while or unless it's a custom quilt that is a perfect match to their décor. This past year (2015), I only booked myself into 2 in-person shows. And this year (2016), I have had some health issues that led to me cancelling all 3 sales I was booked for.The first from last year was way back in September 2015 and was the Etsy Made In Canada Day Sale in Calgary. The second was in November and is one I've done for a number of years and I've built up a bit of a relationship with the regular shoppers there. But I never quite know what is going to be a good seller for me or not. 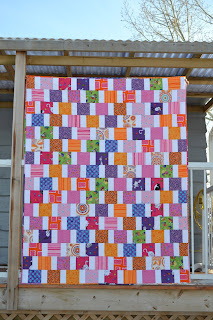 It turns out that the September sale was a great one for baby quilts - I had a much larger inventory there of baby quilts than I usually have and apart from the ones I sold, I gave out cards to a number of moms who were expecting and either didn't know the gender of their babies or exactly how they wanted to decorate their nurseries. When I had time to reflect after I went home, I realized that to woo those customers, I would need to get more or better information from them in the future. I'm really not an in-your-face aggressive person, so my usual default is that customers will contact me if they really want one of my quilts. I usually have a little notebook with me at sales to keep notes and jot down suggestions that customers make regarding colours or possible items they would be interested in. It's not too much of a stretch to take down name & contact info of customers who didn't see the exact thing they wanted and might have bought if I had had it made. 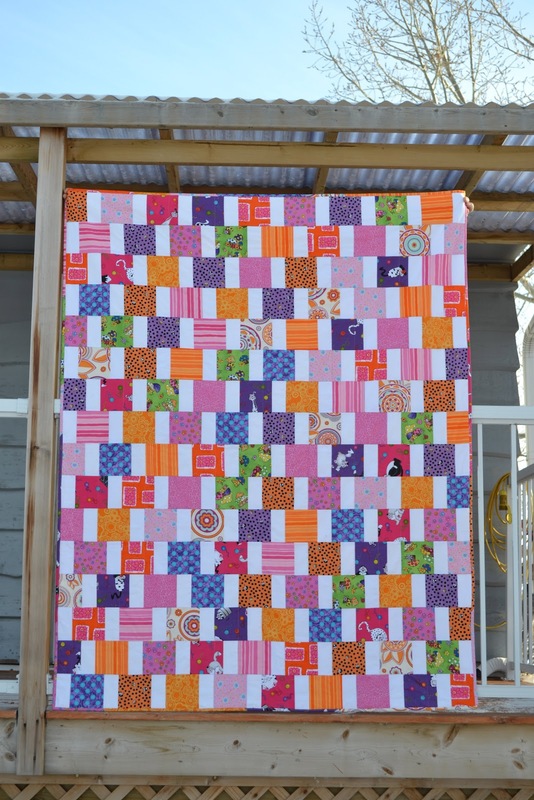 So, when I ran out of blue baby quilts, I could have taken down a name, phone or email and turned that into a custom sale. The next sale in November, I had my plan in place along with my notebook and a pen! And didn't sell any baby quilts. But the mug rugs and snap bags were great sellers and the tissue covers that were a hit in September didn't get a single buyer. I did take down a few orders for a custom mug rug and snap bags in colours that I didn't have ready made. I also had a few requests for eye glass holders, so I wrote that down for a possibility for next Year's markets! 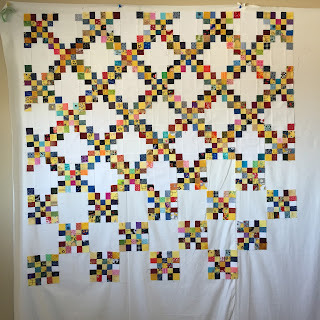 A few other things that I've been considering as possibilities are having an open studio tour & sale maybe a couple times in the year where my larger quilts can actually be shown off to their advantage, which is difficult when there is only a 6' wide table to display everything. And maybe an email newsletter that could come out 3-4x a year, maybe in advance of a studio tour. What do you think? How do you like to connect with artisans & crafters? Where do you buy handmade items locally? Do you like things ready made? Or do you love the custom touch of a one of a kind item made just for you? 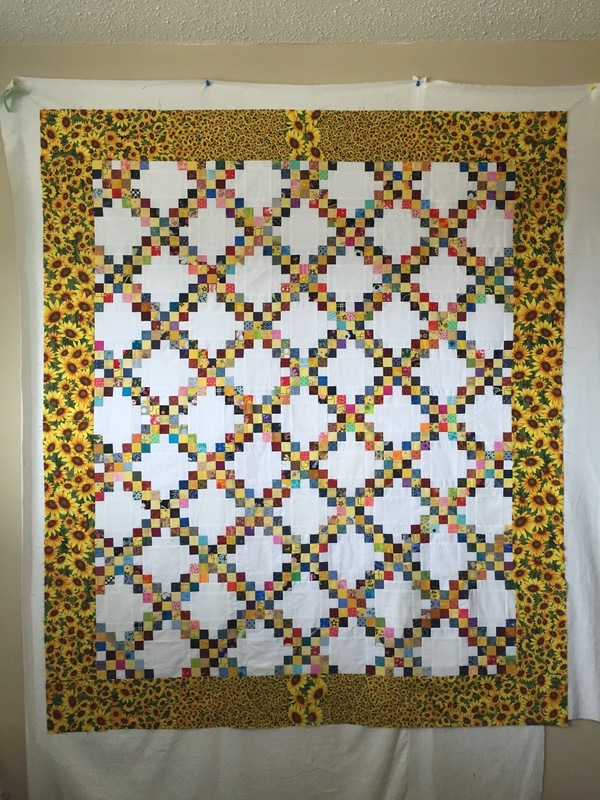 Last fall my mom was making a few of these for her local quilt show and sale. I thought they were pretty cool and have been keeping my eyes open for fruit themed fabric just in case I wanted to make a few. 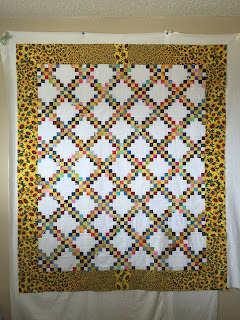 At the end of May at Calgary's Heritage Park's Gathering of the Guilds quilt show, I found some great fruit fat quarters and they followed me home! I already had a tan colored fabric that could be used for the lattice pie crust, some insulbrite and cotton batting and a quick trip into Fabricland netted the shining heat resistant fabric (normally seen on ironing board covers) that would be the pie pan backing. Cutting Directions: I'm not much for finding a pattern for something that I can figure out, so I made a circle template from a piece of cardboard that was about 9" in diameter. For each pie, I cut 1 fruit fabric, 1 insulbrite batting, 1 cotton batting and 1 shiny fabric from the circle pattern. Then I cut myself some 1" strips for the lattice and pressed the long edges a scant 1/4" on each side, leaving me with a 1/2" wide strip to stitch to the top of the "pie". You will need eight pieces each at least 9" long for each pie. 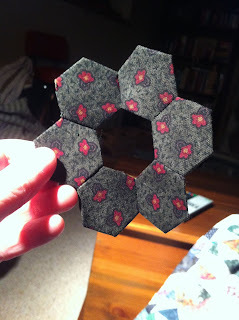 And if you want a loop to hang your pie, cut 1 piece of tan fabric 1.25" x 4". Take your piece of fabric, press in half lengthwise and then press both long edges to the centre fold you just made. 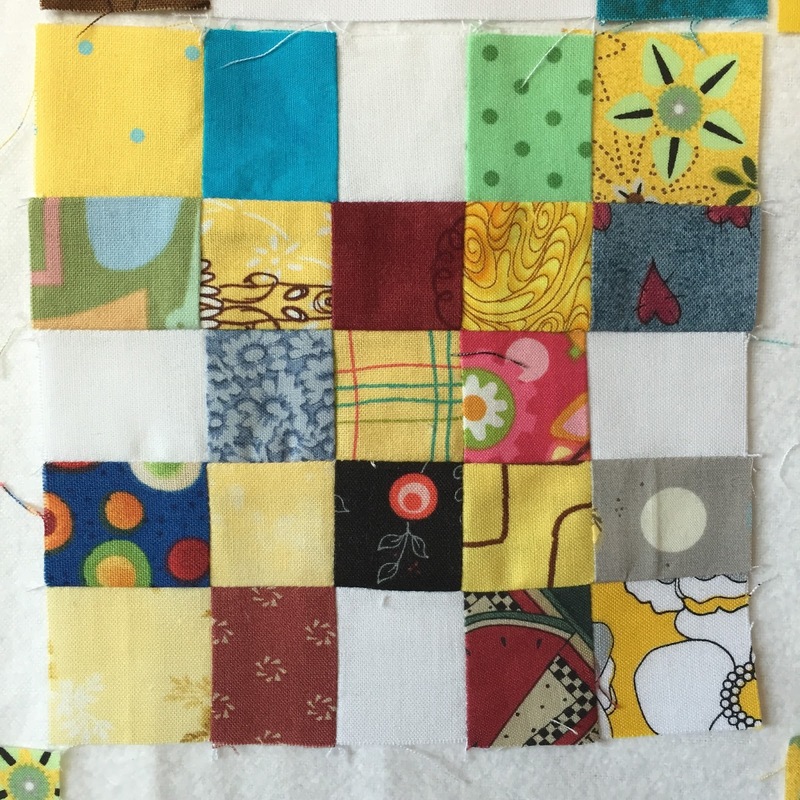 Then press again in half lengthwise and top stitch the edge opposite the fold. Fold in half as shown and top stitch the side opposite the fold. Step 1: Place cotton batting down with the fruit fabric on top. 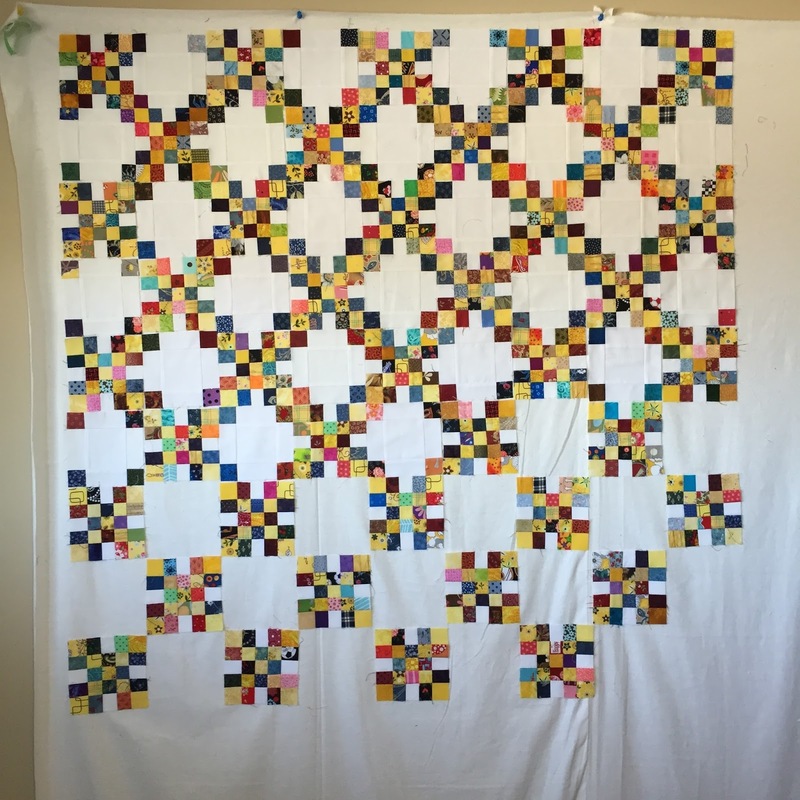 Using 8 pieces of fabric prepared for the lattice, weave 4 horizontal and 4 vertical pieces and space them out evenly in a way that looks good to you. 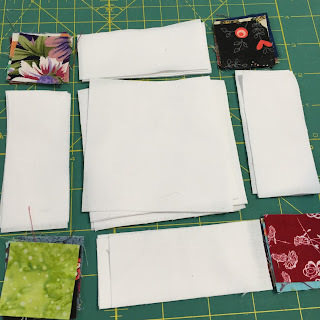 I pinned my pieces down at each end to keep them from shifting before top stitching, but you could use a strip of fusible web or fabric glue and that would work just as well. Just remember if you are using pins to remove them before your sewing machine sews over them! Using an even feed foot on your machine and tan thread to match your fabric, top stitch the lattice to your pie fabric/cotton batting. Trim the "crust" to your pie's circle shape. Step 2: Place the shiny heat resistant fabric wrong side up, add your circle of insulbrite batting and top with your pie filling completed in Step 1. Taking care that your edges line up, pin around the outside edge. Machine baste with 1/8" seam and large stitch length around the outside edge catching all four layers in your stitching. Step 3 (optional): Adding the hanging loop. and stitch to the backside of your layered pie. Before stitching, make sure that the hanging loop is placed where you want it from the front. 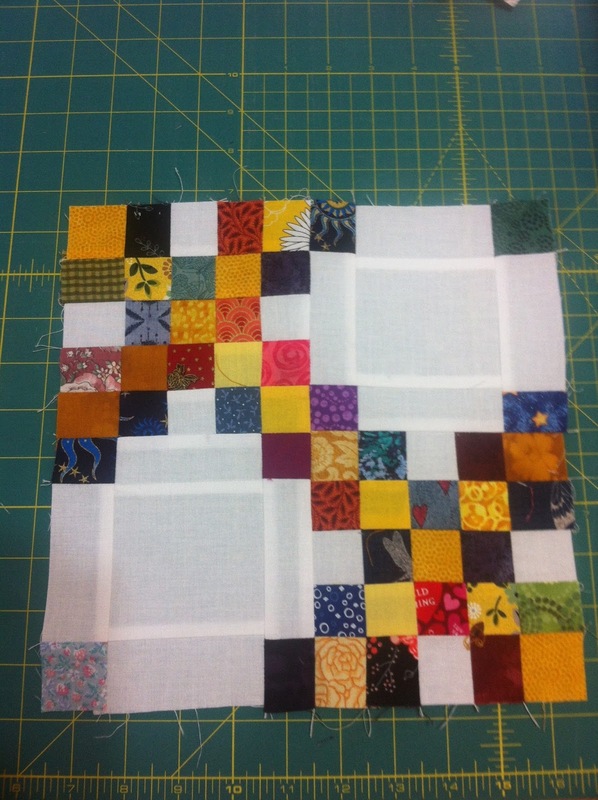 Step 4: Binding. Take your 2.25" binding strip and press in half lengthwise. Pin around the outer edge of your pie on the backside, leaving about 4-5" unpinned on each end as shown. The bias binding should curve nice and easy around the circle and you'll want to pin every inch or so. Mark 2.25" from one end of the binding with a pin. Leaving the 2.25 pin just in the binding, pin the end of the binding strip to your pie. Overlap the other end of the binding and trim to the 2.25" pin so you have an overlap of 2.25". Open up the binding and pin as shown. It may feel a little awkward if you've never done this before, but it will give you a nice finished edge with no noticeable joint. If you're having troubles, just remove a few more pins or fold the pie a little. Stitch a diagonal seam as shown. Trim as shown. Press seam open and then refold this section of binding in half lengthwise. Finish pinning around the entire pie! Stitch around the binding with 1/4" seam, removing pins one at a time as you go, all around. Go slowly and the bias binding will lie flat - if you hurry it will stretch and you'll have a lump of binding at the end you will need to ease in. Turn binding toward the front of your pie and top stitch down with a tan thread on top and a gray thread on the bottom to match your pie plate! You'll have to stretch the binding a bit to cover the stitching and if you find it a little hard, you can always trim away a bit of the bulk around the edge. I like the look of a stuffed binding, so don't mind having to do a bit of stretching! And ta-da! Finished! I can't wait to use mine for fresh pie this summer! The hanging loop lies flat on the back when your pie pot holder is being used. Let me know how your pie making goes!